Well here we are, another Friday and another installment of my Framed Series! Today, we’re honoring a funny photo taken from a wedding I did a few years ago…Tiffany and Cameron’s wedding at the Salisbury House. The day had progressed beautifully and we had just finished the outdoor ceremony amidst the lush gardens of the Salisbury House and also pulled off some great bride and groom portraits. It had rained a bit earlier in the day so things were a little wet, but fortunately that didn’t ruin the outdoor reception which took place under some large tents on the terrace. The music began blasting and the reception was officially underway as people headed out on to the dance floor. All of the guests began dancing and drinking while the DJ lights set the mood for what promised to be an amazing night. Suddenly, a pocket of people began opening up on the dance floor and a large open space was created. Oh looks like a dance-off, I thought. Wrong. In the middle of the dance floor stood two boys who had taken advantage of the wet conditions and rolled in the grass and mud, covering themselves from head to toe. 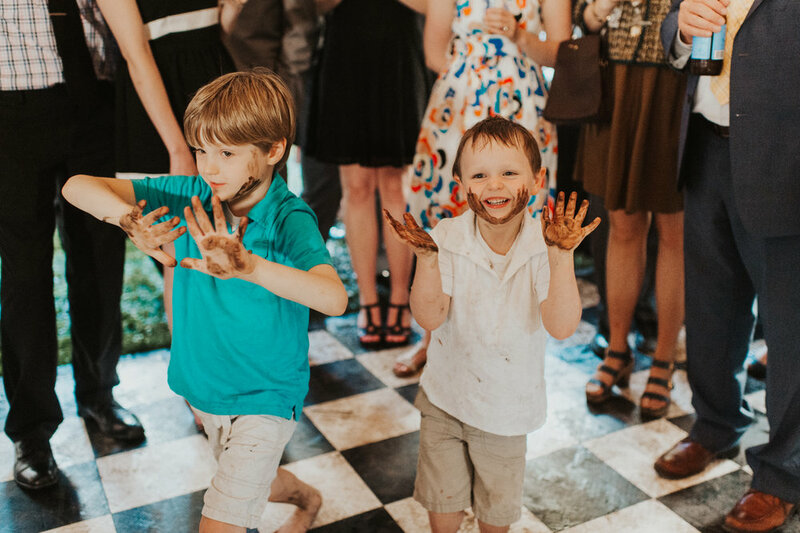 All the guests began laughing while keeping a safe distance as the two muddy kids danced to the music with the rest of the guests.